I say "I'm sorry" when I'm scared and I'm scared 50 percent of the time. The other 50 percent is spent in blissful ignorance as my brain catches up on all the things I should be scared of. I say "I'm sorry" when I point out to a stranger that they've dropped their MetroCard on the sidewalk. I say I'm sorry before I offer my opinion, or when I haven't heard someone clearly, or if someone is feeling sad. Saying "I'm sorry" is how I put up a shield. If I have to put myself out there, unasked and unannounced, then I must protect myself. 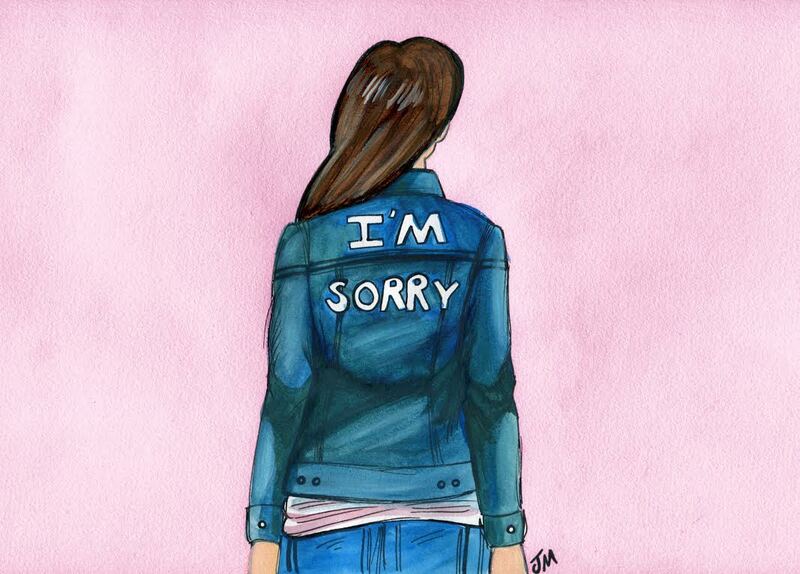 To apologize first is safer than to apologize later; after you're at fault and in the crosshairs of shame and guilt. Part of my brain believes that if I make no noise and shrink until I take up no space, then nothing can hurt me. The other part of my brain knows that this is nonsense. Despite everything I do to avoid getting hurt, I will get hurt. I will feel pain. My reptilian brain tries to reconcile that there are ways to avoid this, but there really isn't. Fear is a thing that makes you quiet, that keeps you small. And for me, my fear is the greatest when I interact with other people. If only my design was of some other nature that I wouldn't need people, then perhaps I could be fearless. But it's not. I am hardwired to crave connection. To speak and to write and to want to be in the presence of people. The first interaction that cracks the surface is always the most difficult. I fear saying hello to a stranger more than I fear the senseless existence of the universe. Fear can keep you on the edge of things until you cannot hold it inside anymore. Until you have to face it or let the flames eat you alive. I've passed on opportunities because my fear of disappointment was greater than my belief that I could succeed. I've let fear keep me on the sidelines of my own life more times than I can count. I would've let it keep me at my last job, where I had become unhappy, but for some reason, I didn't. I was miserable at my old job, but also terrified at the prospect of going somewhere new. I felt trapped in my small gray cubicle, isolated from my coworkers and unchallenged by my work. And when a new opportunity came my way, in order to bring myself to go to the interview, I had to remind myself that I could say "no." Despite how unhappy I was at my old job, the fear of leaving and entering the unknown felt worse. It felt horrible, until at some point, it didn't. Because the pain of standing still became greater than the fear. Delivering the news to my boss that I would be leaving for another job was one of the hardest conversations I've ever had. I was terrified of disappointing her. I struggled through every sentence while on the verge of tears, apologizing endlessly and thanking her for the opportunity. Then I returned to my cubicle. I felt numb. I had gone from feeling too much to almost nothing. I had crossed to the other side of fear. All at once, the realization that I could do anything I wanted, as long as I didn't listen to the fear, was paralyzing in itself. But this new fear was a different animal. It was fear mixed with excitement. I knew that I could push past it when I was ready. It wasn't a wall anymore, but a door. And standing on the other side of a door is a lot easier than thinking about breaking down a wall. So how do I stop saying "I'm sorry" when I'm scared? I take it one day at a time. Saying "I'm sorry" will not protect me from anything and I know that now. I'm always going to be scared; of failure, of disappointment, of not being good enough. But I'm done pretending that I won't feel pain if I'm careful enough, or that I can prevent the pain of others by just wishing hard enough. Saying I'm sorry is a verbal tightrope act, and it's one that I'm done performing. This post originally appeared on Femsplain.com.